Did you know that pesticide and fertilizer residues on grains are NOT regulated for pet food? The multi-billion dollar per year pet food industry goes hand in hand with the human food industry. Many popular pet food brands are now owned by top human food manufacturers such as Colgate-Palmolive, Proctor & Gamble, Del Monte, Nestle, and Mars Inc. There is a very practical reason for this: Waste products thrown out from the fishing, meat, and poultry industries as unacceptable for human consumption are conveniently put into pet foods. Anything that is not considered “human grade” is cheaply re-purposed, and therefore increases profits. The rejects include grains covered in fungi and mold (mycotoxins), chicken feed, slaughterhouse offal from diseased carcasses …and…holding back the upchuck now…euthanized sheep, cats and dogs. 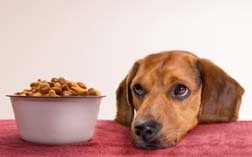 The FDA actually found pentobarbital, the most common pet euthanasia drug, in a study of pet food. The way in which commercial pet foods are processed is cause for concern as well. It can start before the ingredient even reaches the factory. For example, the US Coast Guard apparently requires that fish meal be treated with high levels of the livestock feed preservative/pesticide/rubber preservative called ethoxyquin before being transported on ships. Ethoxyquin (made by Monsanto) has been linked by vets and breeders with reproductive issues, liver problems, allergies, and cancers. In a sick twist of irony, the Monsanto company themselves have reportedly placed labels on containers of ethoxyquin warning people to wear protective eye and skin gear when handling it, and that contact with this substance can cause skin and respiratory irritation. Some manufacturers try to falsely boost protein content by adding gluten meal, rice protein, and corn gluten, because it’s cheaper than using real animal protein. One unconscionable example of this practice happened when Chinese pet food manufacturers added melamine to falsely boost protein in nutrition profiles. This reportedly resulted in the sickness and deaths of thousands of pets around the world, and spurred subsequent large scale recalls. A dog’s food for the most part should never be cooked. It should be fed in a raw or partial raw natural state just like nature intended. Cooking a dog’s food ruins most of the nutritional value. Kibble is cooked. Kibble dog foods for the most part have as their main ingredient cereals – the main ingredient your dog should be eating is raw meat and raw meaty bones. These very cereals are a root cause of many problems including allergies. The vast majority of commercial dog foods have far too much carbohydrates in them. High levels of carbohydrates are linked to over-eating, diabetes, weight gain, and numerous other problems. Dogs should eat a diet with only a small amount of carbs. Some of the most dangerous ingredients in commercial dog kibble the preservatives, colors (dyes), and salt. BHA & BHT being at the top of the danger list. Some preservatives used in dry pet food are worth avoiding, such as butylated hydroxyanisole (BHA), butylated hydroxytoluene (BHT), propyl gallate, propylene glycol, and ethoxyquin (pdf), all of which are used frequently.. BHA is a probable canine carcinogen, a cancer-causing agent. BHT can cause organ system toxicity. Its not as simple as label reading to avoid these toxins. In order to keep them from view from consumers, the commercial pet food makers buy their meat already containing the two preservatives. This avoids having to place it on the label of ingredients. Tricky business. And not to mention the rampant overuse of antibiotics in commercial cattle production. Well then, why do so many people still feed their dogs commercial dog foods? Your vet is most probably recommending a commercial diet because of financial inducements and a lack of independent learning. Most people feed kibble because its easier and thought to be cheaper.. commercial dog food companies have got the advertising part down amazingly well. They have entered the market at every point. With some companies, breeders and vets get major discounts and kick-backs for selling their product. They sponsor dog shows, they advertise in dog magazines, they get high profile people (including vets) to talk about their product. And most importantly, there are also considerable kickbacks to vets, vet schools, and breeders even receive from recommending a commercial diet. All of the information contained within the article is easily verified. We just tend to be to busy to learn nutrition and adopt the right program. We are changing that one pet at a time.